Montgomery County is a great place to soak up the summer sun, from splash pads to farmer’s markets. Townships and cities multiply the fun with outdoor activities all season long. Whether you are looking for the perfect place to get outside and play or a place for you and your kids to learn a new skill, you can find it this summer in our amazing county. This Summer Fun Guide will help plan your perfect summer. Held each Sunday evening on the campus of Temple University. 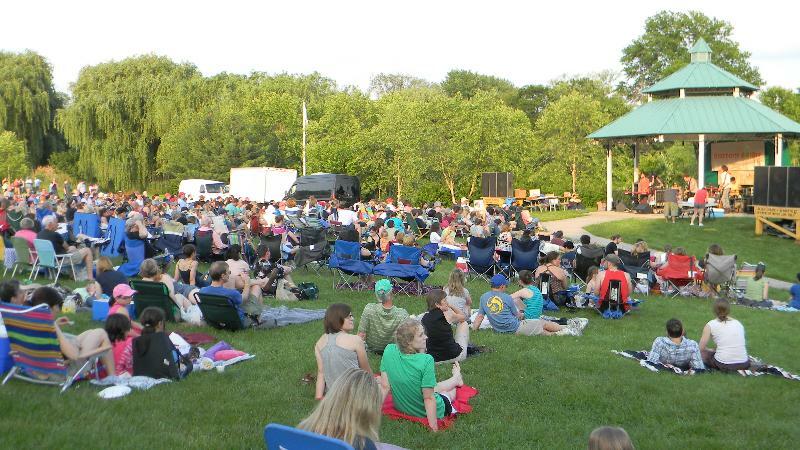 The concert series is sponsored by the Upper Dublin Parks and Recreation. Free to the public. No pets allowed. In case of inclement weather, concerts will be moved indoors to the Learning Center. More info at ambler.temple.edu or call Upper Dublin at 215-643-1600, ext. 3443. Parking lot next to Trax Restaurant & Café located at W. Butler Pike & S. Maple Street in Ambler, PA 19002. Open every Sat. from 9 am to 1 pm. Variety of vendors selling meats, cheese, wine, veggies, pastries, coffee. Kids activities and music too. Annual event featuring 16 hours of live music from 75 artists. Food and craft vendors, restaurants, juried art show, kids’ activities, beer garden. Visit amblerfest.org. Annual celebration of pooches – a day for bringing your dog everywhere in town for fun activities and contests. Runs from 10 am to 2 pm. Race day events from 7 am to 4 pm. Bike races for all levels from kids to amateur to professional featuring a 5-corner 1.08 mile course in beautiful downtown Ambler. Lots of activities and food throughout the day. For info and to register to participate visit www.bikereg.com/ambler-bike-race. The Complete History of America (Abridged). Commonwealth Classic Theater Company presents this zany, fast-paced romp through all of American history. Humor and history to celebrate America. June 28 – Rave On! July 26 – Mike Greer & Co. Located in the Marketplace at Telford Station, Penn Ave. & Main St., Telford PA. This market is a Producer Only market meaning all products must be sold by the grower, maker or crafter. For info on the vendors, visit www.stmainst.org/farmers-market. Every Wed. all summer at 7 pm, free concerts held in Narberth Park, in front of the Chet Tyson Pavilion. Bring chairs or a blanket, a picnic dinner for a great evening. Small refreshments will be for sale. All concerts start at 7 pm. Most tickets are $15 (age 16 and under, free). Order in advance online at www.brynmawrtwilightconcerts.com. 175 W. Valley Forge Rd., King of Prussia, PA. Food vendors and beer garden beginning at 5 pm. Not outside alcohol permitted. Thursdays in June – 11:30 am to 1 pm. Live music and free food samples available from various KOP restaurants. The Town Center green will become an outdoor movie theater during select nights during the summer. Free showings begin at 8 pm. Bring blankets and chairs. Relax on the green select Thursday nights for free, live concerts by local artists – 6 to 8 pm. Every Tuesday during the summer drop in for an outdoor yoga class from 5:30 – 6:30 pm. Bring your own mat, towel and water. Class run by Stillpoint Yoga Studios in KOP. Each week will feature post-class specials from KOP Town Center restaurants. No class July 3. 100 Station Ave., Oaks, PA 19456. The internationally acclaimed touring company will present its newest show at the Greater Philadelphia Expo Center. Volta is a story of transformation depicting freedom that comes from self-acceptance. Witness stunning physical displays of artistry including BMX riding, ballet, aerial artists and acrobats and shape diving. Experience life under the big top in a whole new way. More info and tickets at www.cirquedusoleil.com. New art exhibitions, restaurants with outdoor dining and live music – the first Friday night of every month. The Manor House Estate, 4059 W Skippack Pike, Skippack, PA 19474. Craft show and kids event with cartoon characters, games, moon bounce, face painting, and more. Cedars Country Store, 3401 Skippack Pk., Cedars, PA 19423. 3rd Sat. of every month May – Oct., 8 am to 2 pm. Outdoor flea market featuring antiques and collectibles. Located next to Cedar’s Antique Emporium and several restaurants. 251 Manatawny St., Pottstown, PA 19464. Open daily 10 am – 7 pm, free to the public. Wilson St., Pottstown, PA 19464. . Annual soapbox derby race for kids ages 7-20. See the derby website for more information. Cheer the kids this year, and build a car for next year’s race.